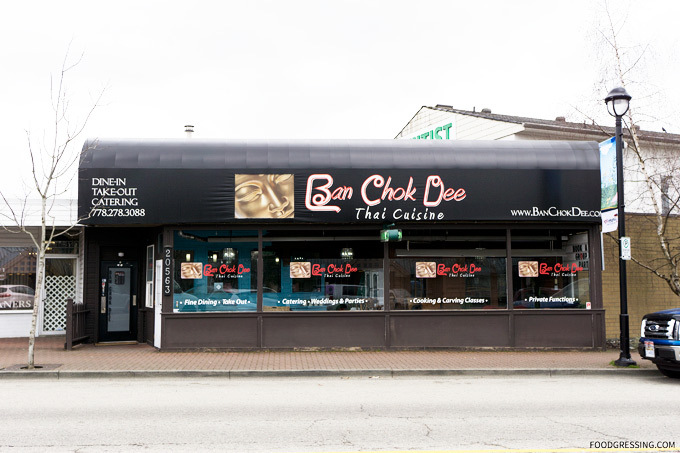 Ban Chok Dee Restaurant is the sort of place worth driving for. 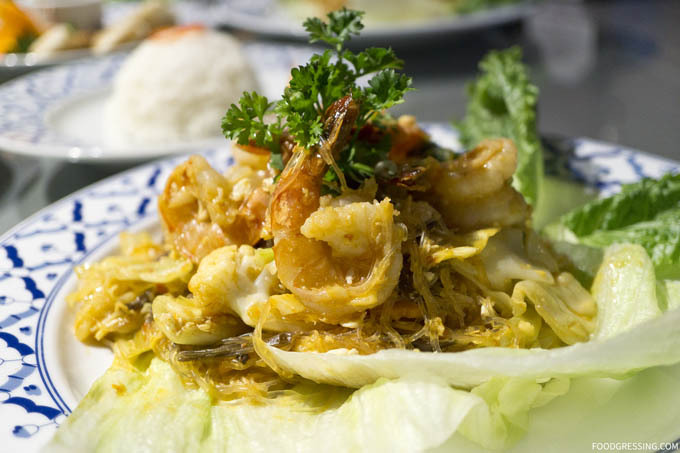 Specializing in authentic Thai cuisine, Ban Chok Dee is known for their artfully presented dishes while still maintaining a casual, relaxed atmosphere. Chef-owner Parinya Loptson is the mastermind behind Ban Chok Dee and she is the epitome of girl power being a female chef and entrepreneur. 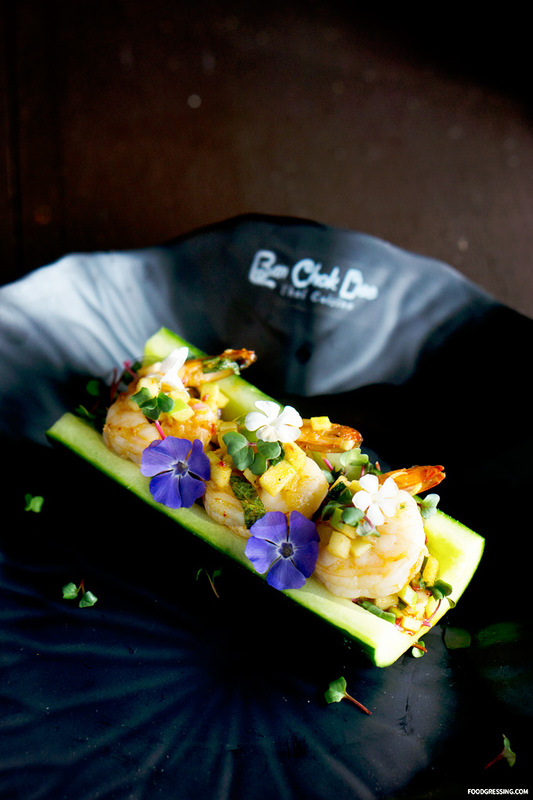 Last month, I had the opportunity to visit Ban Chok Dee, meet Chef Lopston and try some of her creations. As a judge for the Vancouve Foodster Curry Challenge, I tried Ban Chok Dee’s participating dish called Springtime Scallops in Thai Curry Sauce. The dish was inspired by springtime in the Lower Mainland. It featured seared jumbo scallops infused with pandan leaves; Thai rice crackers stuffed with smoked, spiced bale-infused pork belly; pickled jicama; and caramelized cherry tomatoes. 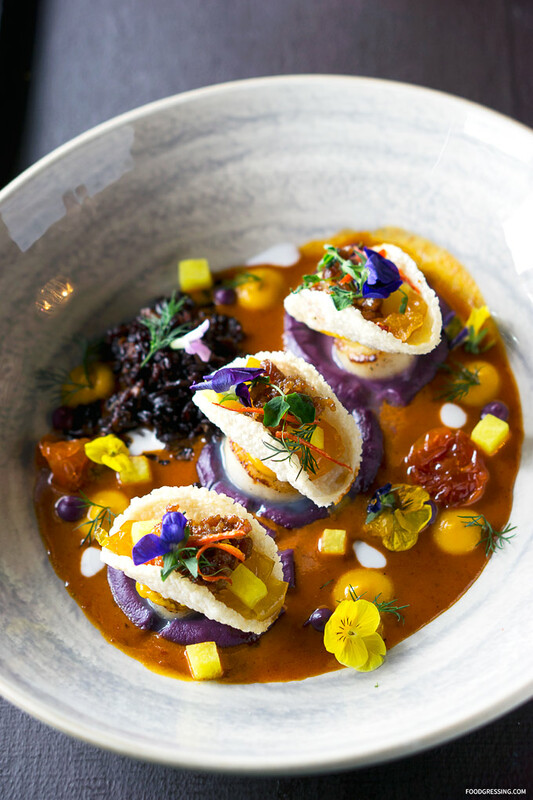 These were served in Thai curry sauce; purple and orange sweet potato purée; basil drops; dehydrated fruits with coconut jasmine rice and garnished with edible spring flowers and dill. I loved the juicy scallops, stunning presentation, bold flavours, and overall creativeness. The use of purple yam was unique. It was a very fun, non-traditional execution for a curry dish. I liked how the chef took risks and the end result was impressive. Ban Chock Dee end up being the media judge’s winner for the Curry Challenge. 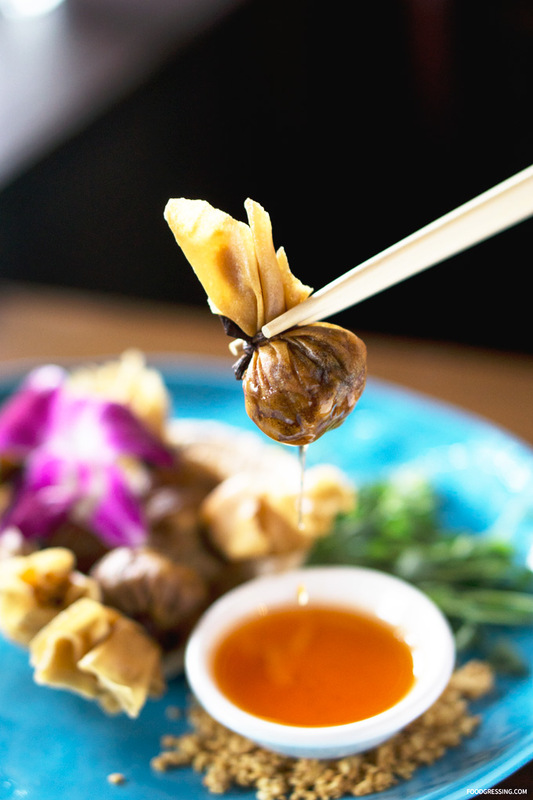 Chef Lopston is such a talented chef; she is able to take a simple dish like wontons and turn it into art. 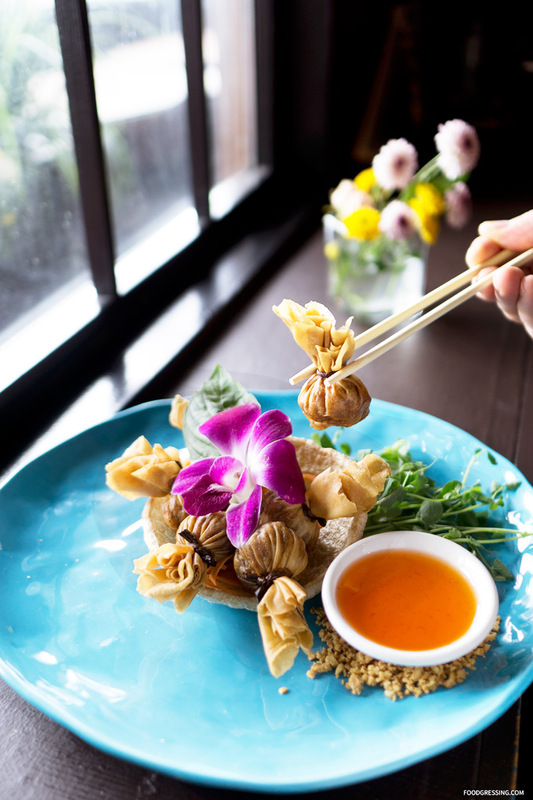 These artfully presented wontons were incredibly crispy on the outside; they were filled with pork, garlic, cilantro and ground pepper. It’s a rather labour intensive dish; in fact, the wonton wrap is made in-house. Served with homemade sweet plum sauce. A Traditional Thai snack bite combining all Thai tastes (sweet , salty, sour, spicy, coconuty, peanuty ) and savoury herbs in one bite. 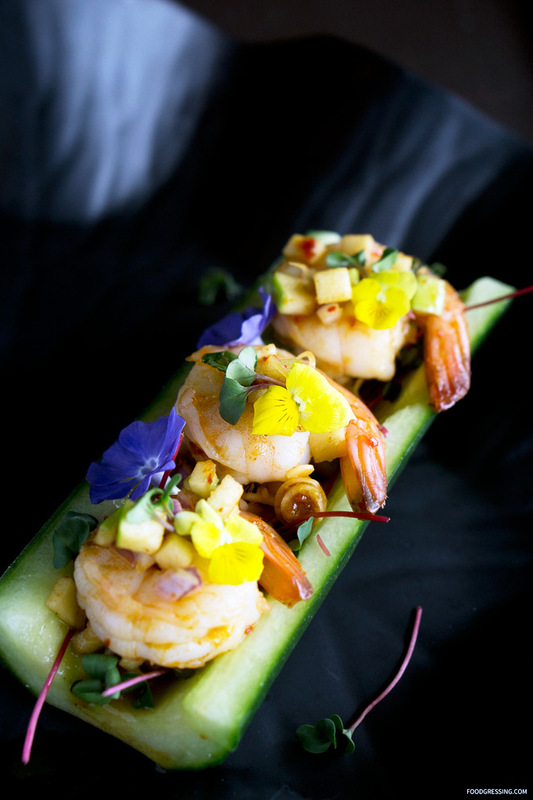 Mixed Thai chilies oil with lemongrass, shallots, apple, cilantro, lime juice, fish sauce and prawns served on cucumber block. 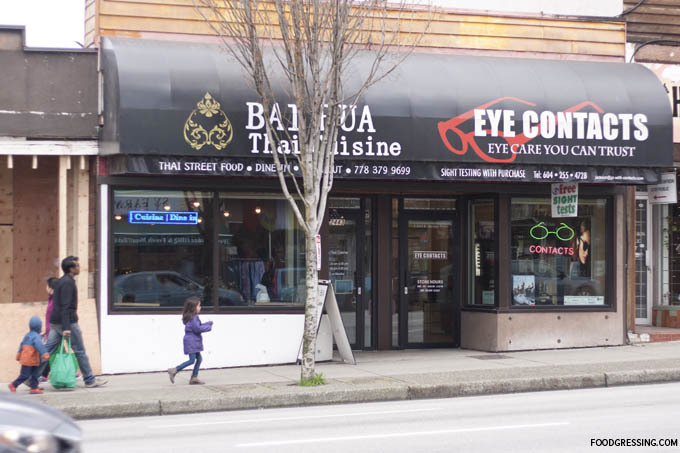 Thai Basil is one of the more popular Thai restaurant chains in Vancouver with three locations (Kitsilano, Thurlow, West Broadway) and an upcoming fourth location on Commercial Drive. 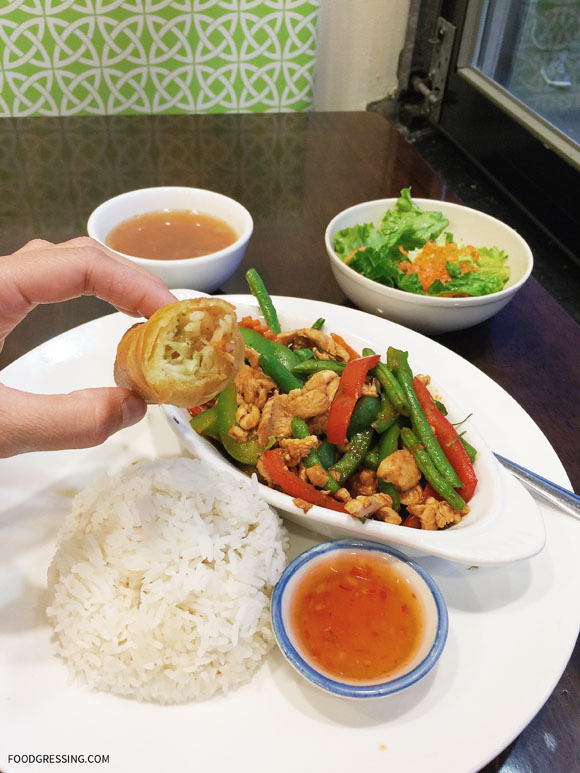 Good for dine-in or takeout, Thai Basil offers fast and tasty Thai food at affordable prices. 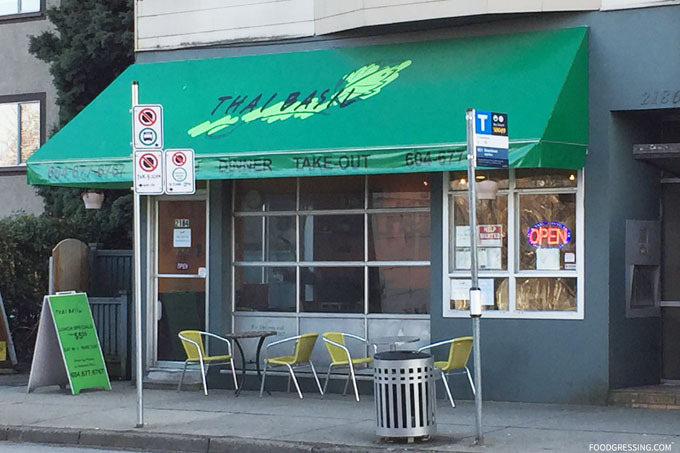 The Thai Basil on Thurlow is my usual location but I have ordered from Thai Basil in Kitsilano on a few occasions. 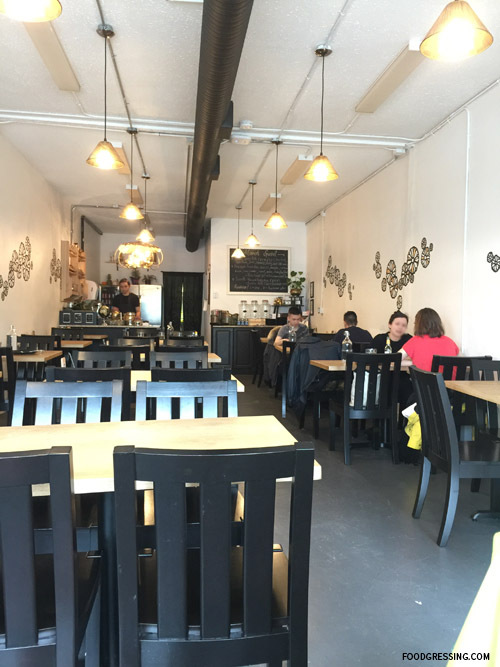 Thai Basil Kitsilano is more spacious than the Thurlow location. There are several dining tables and counter seating by the window. 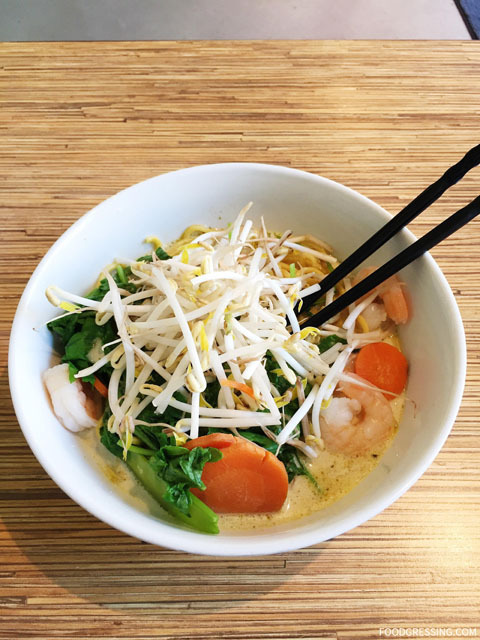 Thai Basil’s menu includes satay, salads, soups, 12 oz bowls of curry, noodles, and more. For proteins, you can choose between chicken, beef, pork and prawns (certain dishes). There is the vegetarian option of tofu as well. The cost of 12 oz. curry bowls range from $8 – $9 while entrees range from $8 – $10 plus tax. On one occassion, I had the daily special which was kanomjeen kiaw waan . It was a spicy green curry with Thai eggplants, homemade fish balls, chili and thai basil served on rice vermicelli. Topped with sprout and pickle sour mustard. The dish was overall very tasty with a rich, creamy green curry. It also had a nice spicy kick to it. 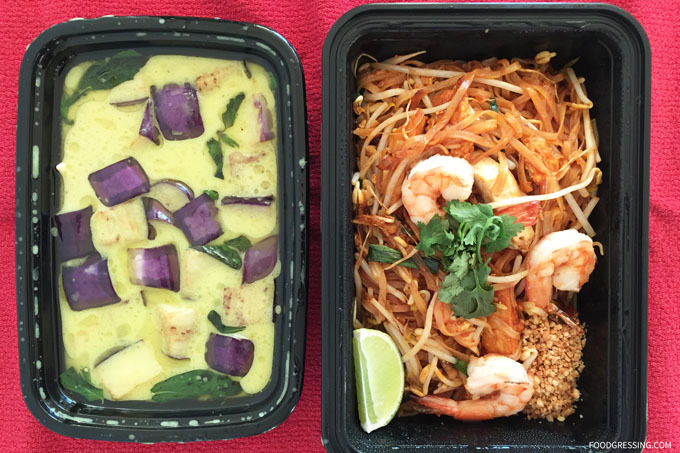 On another occasion, I went with the green curry with Japanese eggplants ($8.50) and a pad thai ($10) for takeout. The pad thai had rice noodle wok fried with sprouts, egg, green onions, tofu topped with crushed peanuts, and cilantro. The green curry was nice and flavourful with tender eggplant pieces but the pad thai was horribly bland. I would not order the pad thai again. 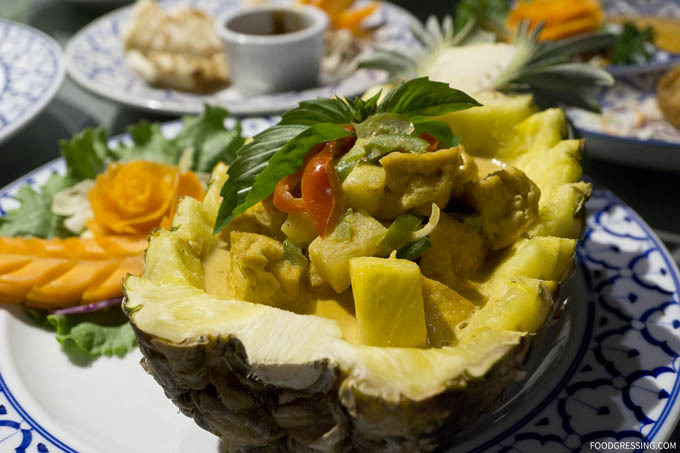 This month, Thai House is celebrating their 30th anniversary! Their story began back in 1986 where they opened their first location on Robson. As a thank you for 30 years of customer support, Thai House is reintroducing menu pricing from 1986. 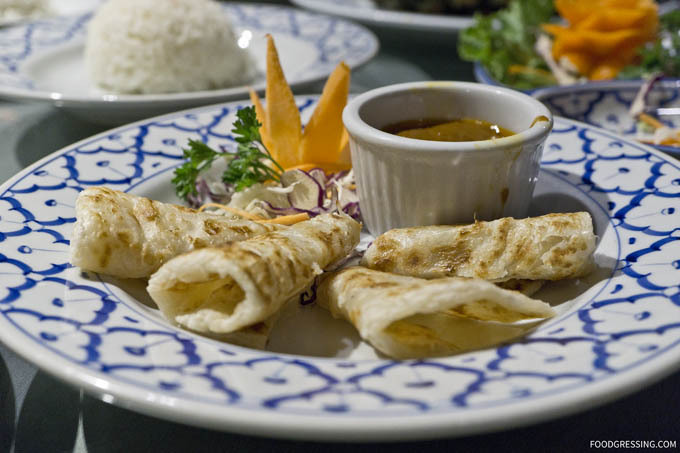 Available throughout the month of November at the Thai House Kitsilano, North Vancouver and Richmond locations, the 30th Anniversary Menu highlights the most popular dishes throughout the past three decades. 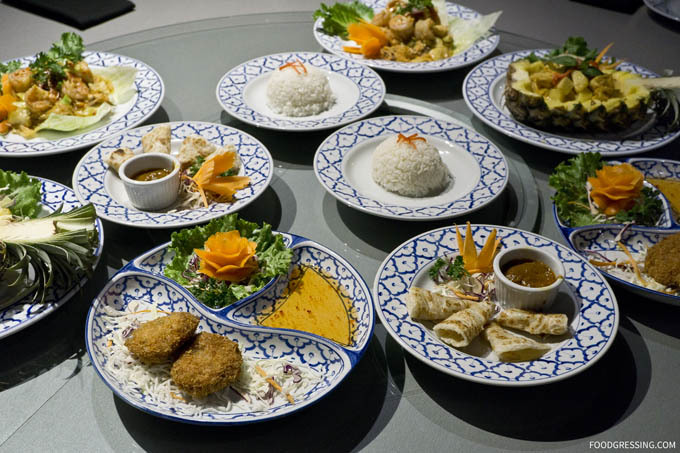 Recently, Diana (Foodology.ca) and I had a media tasting of their anniversary menu at the North Vancouver Thai house location. 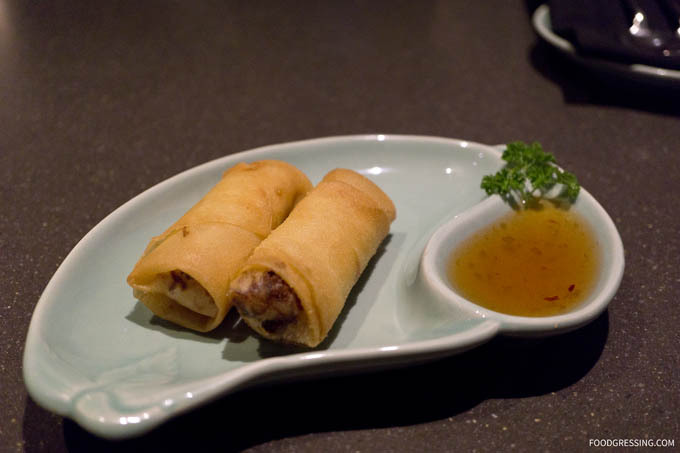 To start, we had two vegetarian deep-fried spring rolls which were wonderfully hot and crispy. Although they come with homemade sweet chili sauce, I thought the spring rolls were tasty enough on their own. 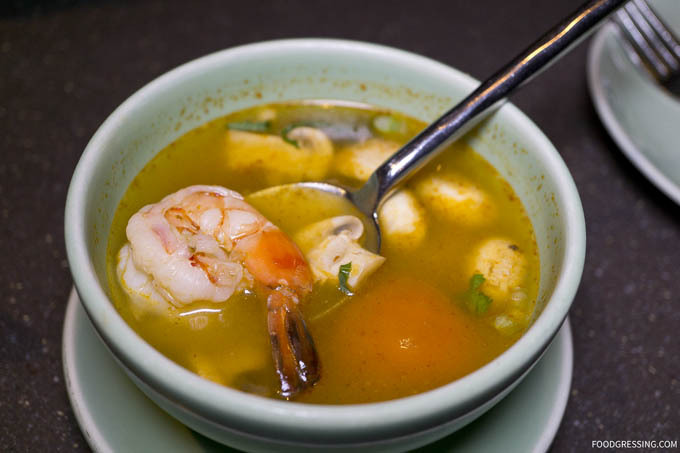 The Tom Yum Goong soups were spicy, sour and flavourful. It had more than enough Thai spices to tickle the taste buds. The soup also had tiger prawns, mushrooms and lemongrass. 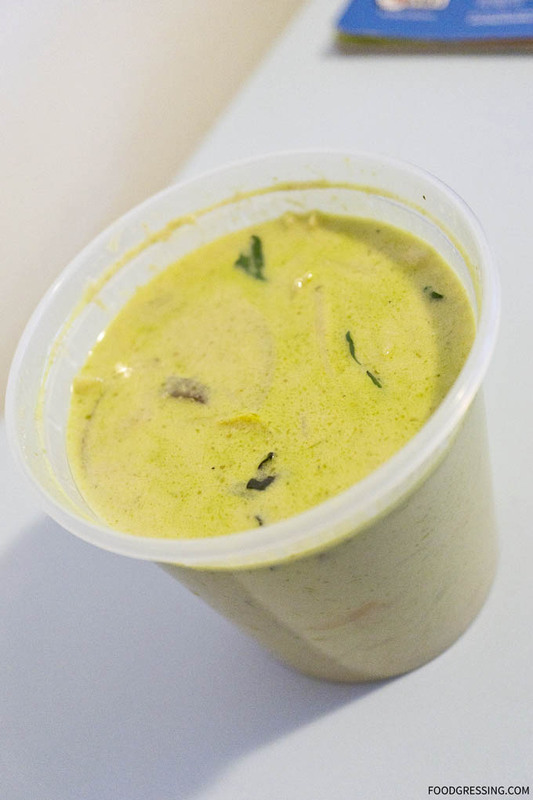 The green curry chicken was rich and creamy from the coconut milk. One improvement would be the chicken as it tasted a bit dry. 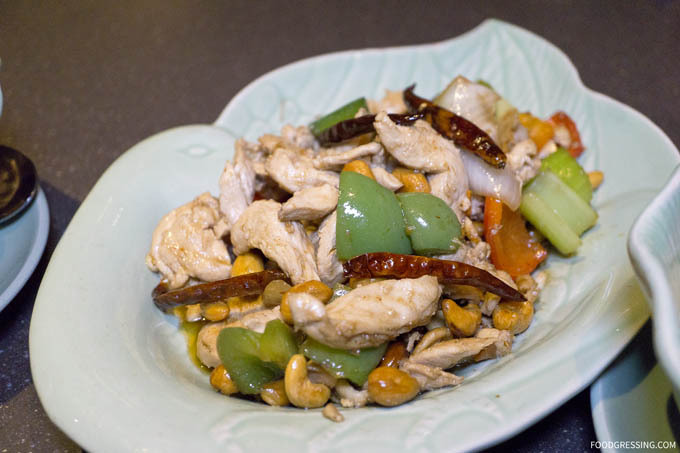 The sauteed chicken with mixed vegetables and cashew nuts was a hearty, stir-fry which went well with rice. 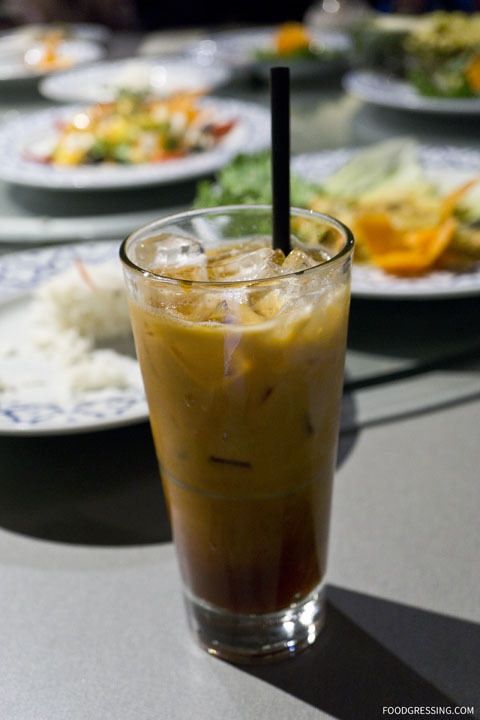 Outside of the anniversary menu, Diana and I also had a fresh young coconut and Thai iced tea. I thought that the coconut juice was absolutely refreshing and Diana felt that the Thai iced tea had the right amount of sweetness. While dessert isn’t included in the anniversary menu, the sticky rice with mango was a solid choice that nicely cleansed the palate. 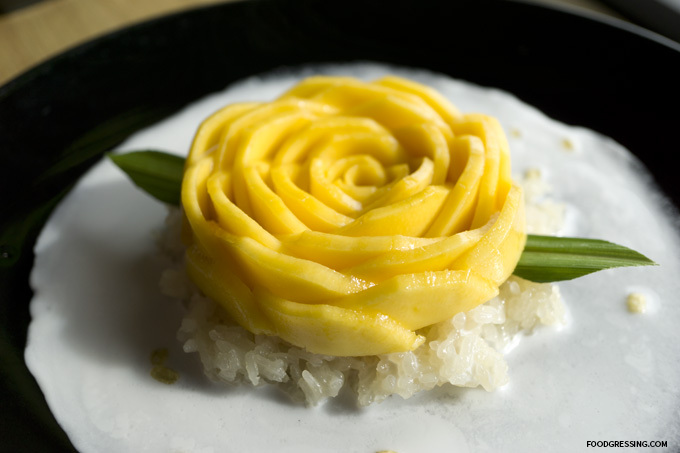 Glutinous sticky rice with sweet coconut milk and served with tender, fragrant mango slices. 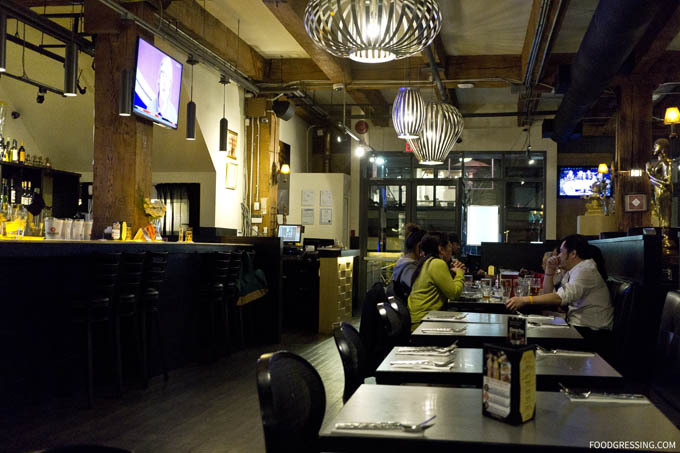 Foodies, have you got your reservations yet for Taste of Yaletown? This unique and delicious festival is on for two weeks until October 27th showcasing the very best of Vancouver’s chefs as they create special menus, tasting plates and pairings. You have the opportunity to select special offerings from participating restaurants with prix fixe menus at $25, $35, or $45. 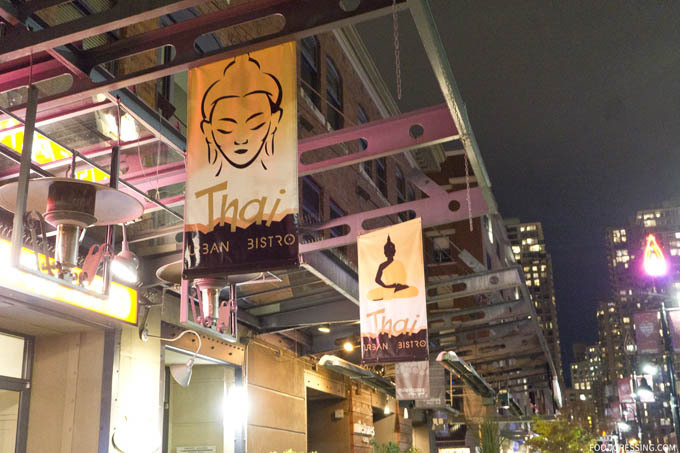 Last week, I had the pleasure of attending a media tasting of the Taste of Yaletown menu at Urban Thai Bistro. 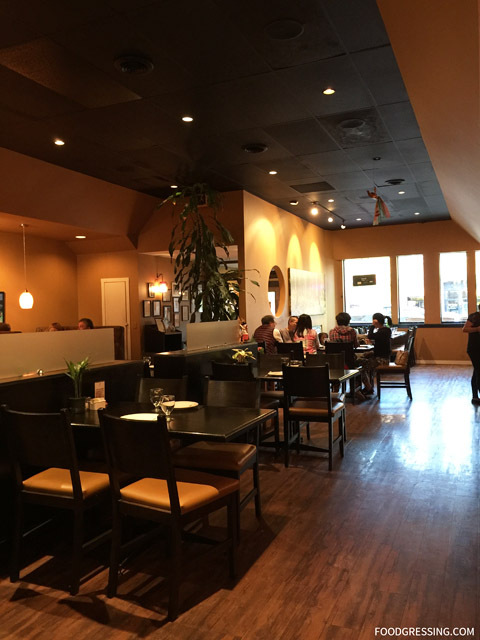 Urban Thai Bistro’s dining space is sleek and stylish with many cozy booths and banquettes. 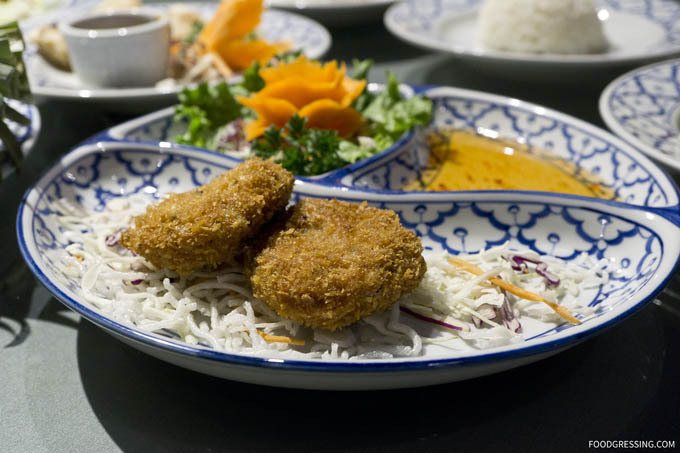 For Taste of Yaletown, Urban Thai is offering an appetizing menu for $25 which includes one appetizer and one entree. 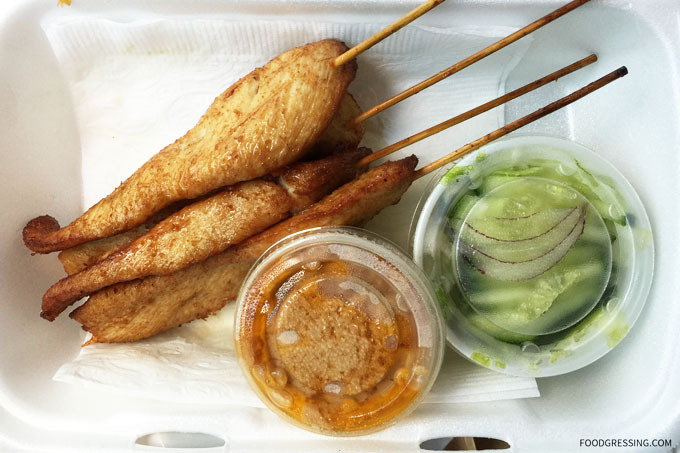 For appetizers, choices are fruit salad, tod man gai (Thai style chicken nuggets), or roti. 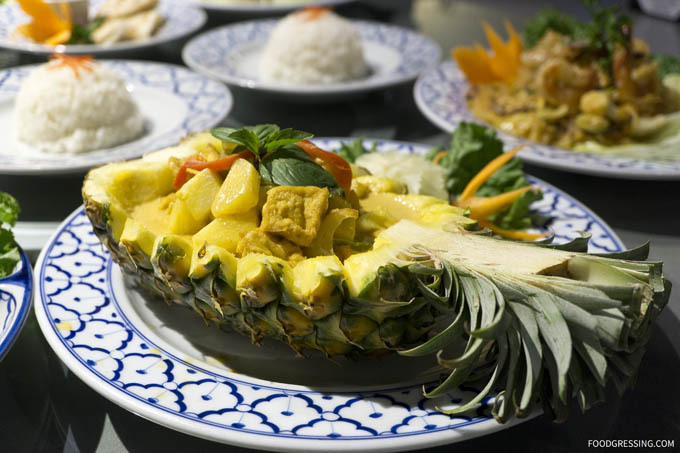 The main entree selections are Keang Sapparod Tofu (yellow curry with coconut milk, diced pineapple, onion, and bell pepper served in pineapple shell) or Suki Hank Prawns (stir-fried vermicelli and mixed vegetables with chef’s special sauce). 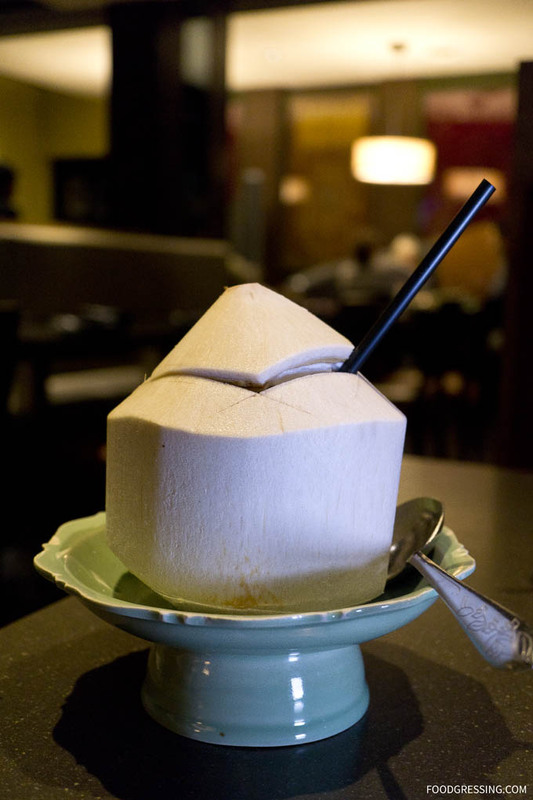 A dessert option is available for an extra $3 and is a pumpkin & taro in coconut milk. 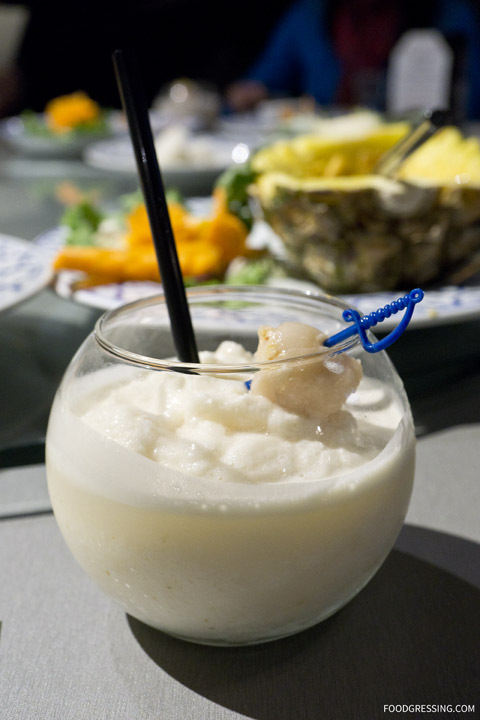 As for drinks, the Royal Thai featuring lychee in coconut milk or a Thai Iced Thai are recommended. I quite enjoyed the flavourful dishes offered by Urban Thai Bistro. My favourites of the evening were the Thai-style chicken nuggets, and both entrees. 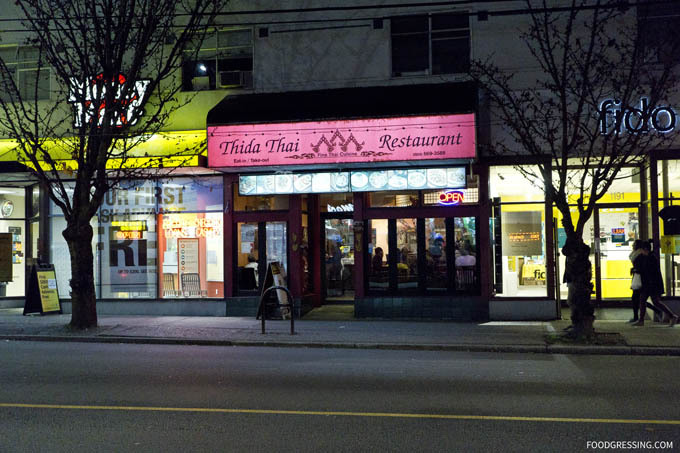 One of the longstanding Thai restaurants on Davie is Thida Thai which opened in 2004. 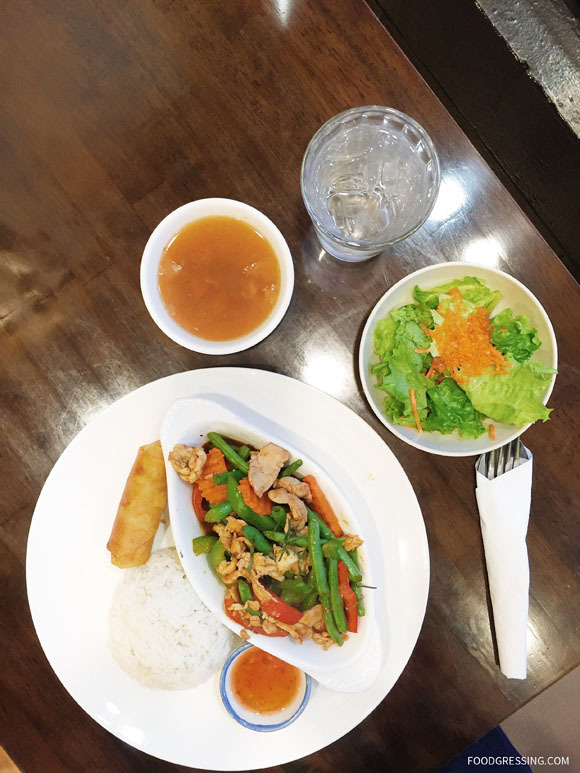 Over the years, I have dined at and had takeout from Thida Thai. Went with a few friends on a weekday night to this restaurant. It was empty before we got there around 6 pm, but a few customers came afterwards. The food was decent and the portions were decent but not large. Pad thai and mee goreng were about $10 each. The curry dish was about $13. The skewers were expensive: pretty much $2 for each piece. It’s a family run restaurant and does not have much decor. I recommend this place for a casual dinner. Since then, I have ordered takeout from Thida Thai several times. 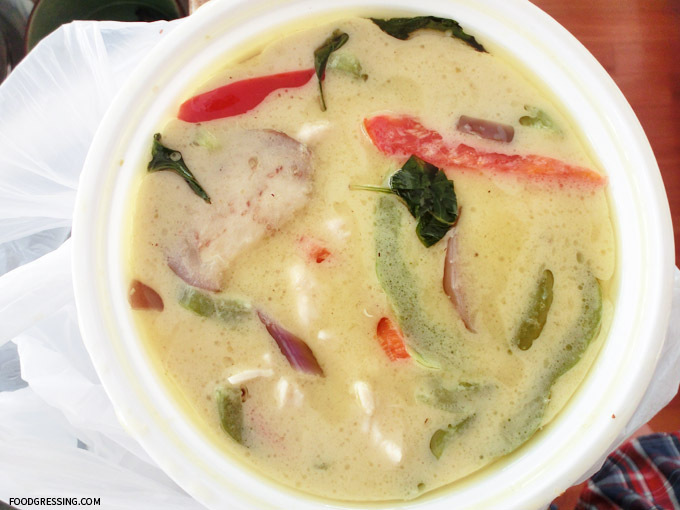 One of my go-to items is the home-style green curry made with coconut milk, eggplant, bamboo shoots, bell pepper and basil leaf ($13). It comes with choice of protein (chicken, beef pork or tofu). Rich, flavourful and subtly spicy, the curry is absolutely delicious. 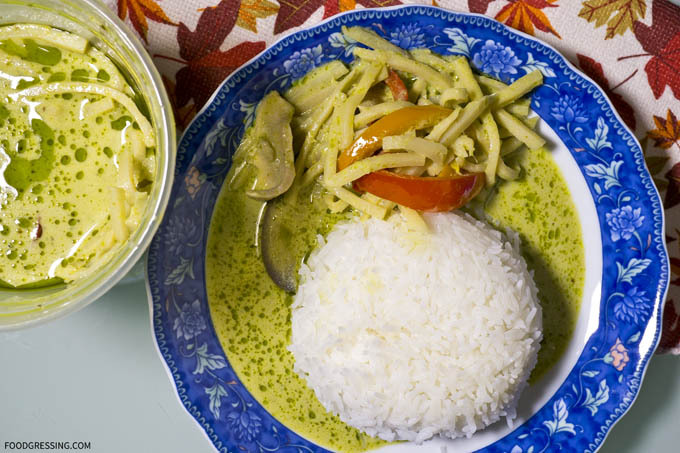 As a fan of bamboo shoots, I enjoy how Thida Thai’s green curry is loaded with them. The curry is just perfect on a rainy night where I don’t want to cook. I’ll make my own rice at home, pour out the green curry onto a plate, curl up on the couch, and watch some Netflix. 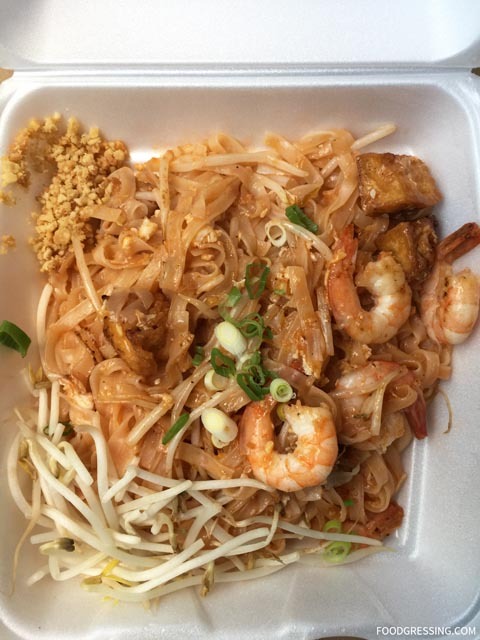 Another dish that I order from Thida Thai is simply a pad thai ($13). Lots of great flavour here – sweet, salty, sour, and spicy. The noodles were soft and slippery but still had moderate firmness and chewiness. My choice protein is usually shrimp but chicken is an option too. 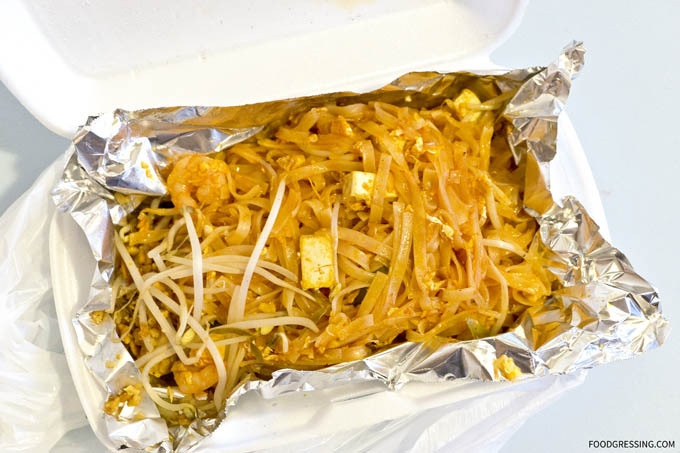 Mixed with tofu, bean sprouts and ground peanuts, the pad thai is just fabulous. 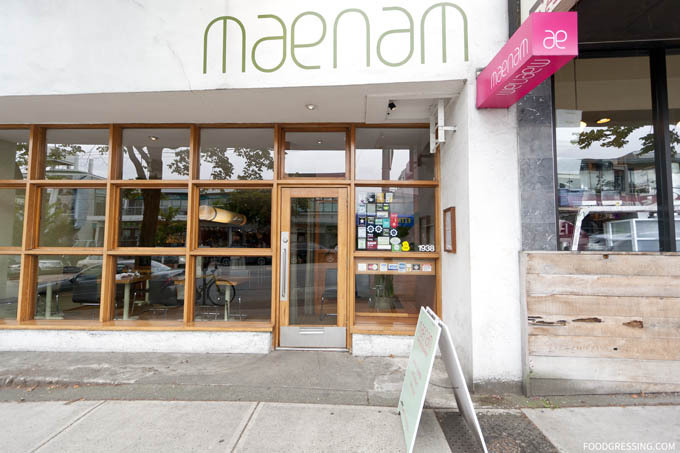 Since opening in 2009, Maenam quickly became a premier Thai restaurant in Vancouver. 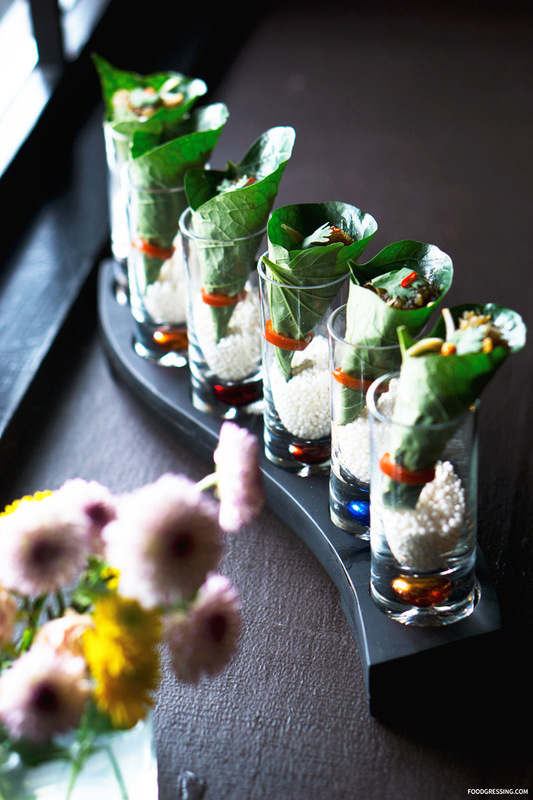 With their innovative take on traditional dishes, Maenam has received numerous awards and accolades. Most recently, they were given the prestigious title of “Restaurant of the Year” in 2016 by Vancouver Magazine. 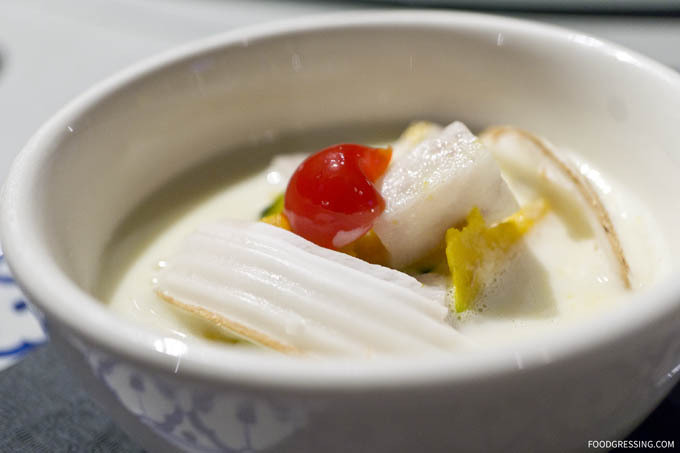 The executive chef and owner of Maenam is Chef Angus An who trained at New York’s prestigious French Culinary Institute and worked at the best fine dining restaurants in London. 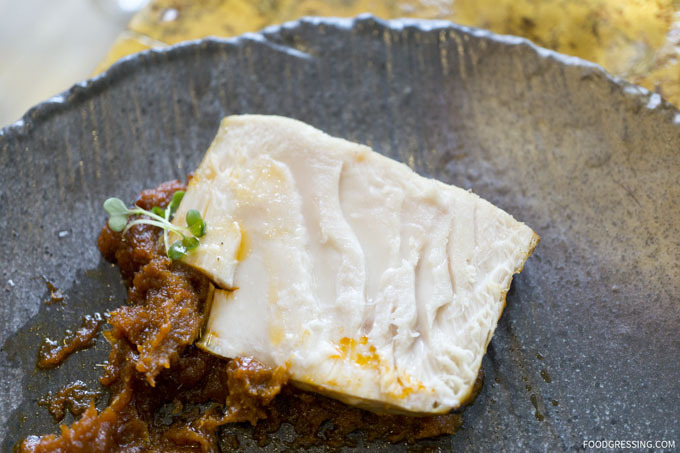 Maenam is his second restaurant venture with the first being Gastropod that closed in 2009 during the economic crisis. 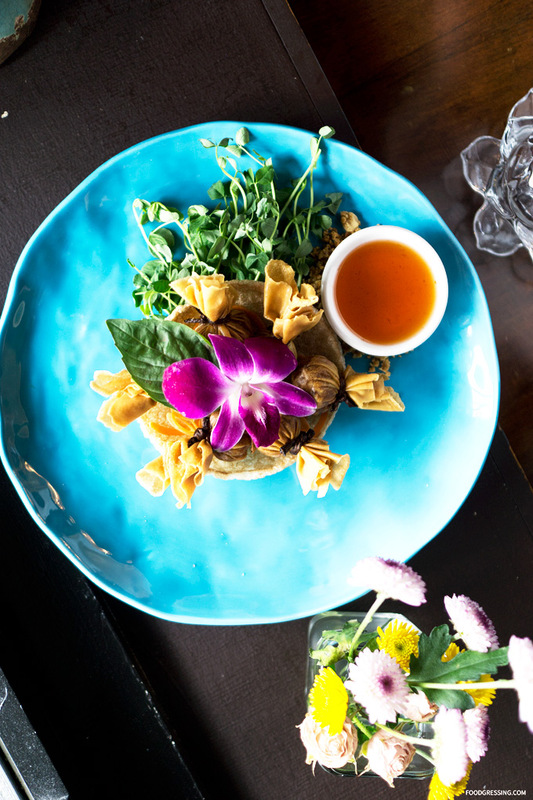 With Maenam, he’s reinventing traditional Thai cuisine by making it contemporary, sexier but still keeping it simple and balanced with fresh flavours from locally-sourced ingredients. I ventured to Maenam for a lunchtime gastronomic experience last week. Because Maenam is only open 12 – 2 pm for lunch, I had to coordinate mine and my husband’s schedules to make a special trip to Maenam. Reservations can be made via OpenTable. 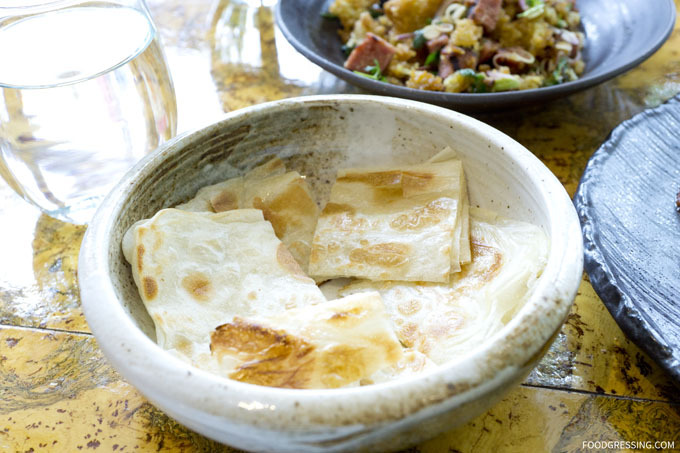 For lunch starters, they have a selection of soups and salads priced between $12 – $16. There are 6 choices for lunch mains priced $16-$17: grilled hanger steak salad, pad thai, banana blossom and fresh baby corn salad, dry red curry of grilled albacore tuna, and stir-fried beef with holy basil. 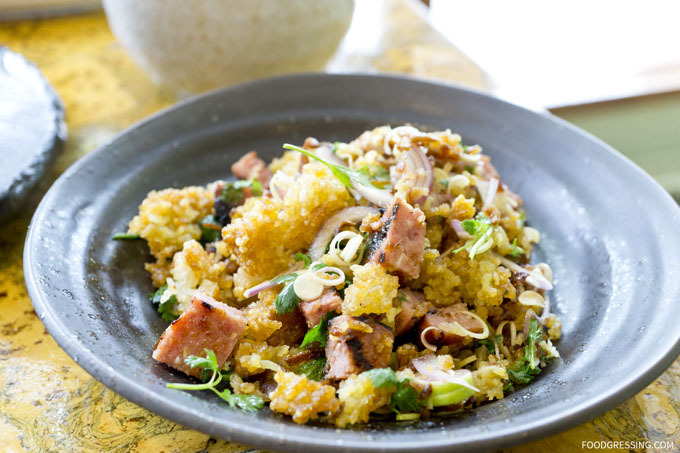 We started off with the grilled thai sausage and crispy rice salad which was textually fun to eat. The house-fermented pork sausage had a sour taste and was better when eaten with the rice. The rice salad consisted of crispy curried rice puffs which I savoured small portions at a time. The hand made roti was subtly sweet, super crispy on the outside and soft and springy in the middle. I really enjoyed the fact that it was considerably less greasy than roti I have had elsewhere like Banana Leaf and Kaya Malay. You could totally handle the roti with your hand without it getting messy. 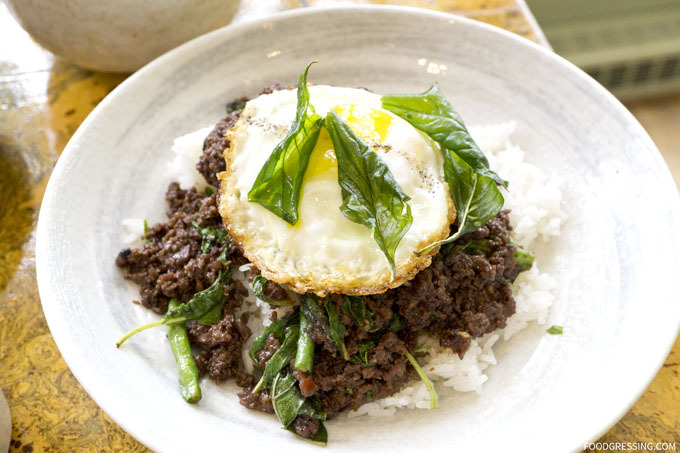 Moving on to mains, we had the stir-fried beef with holy basil with house minced hanger steak, bird’s eye chilies, garlic, a fried egg on top of rice. The dish was wonderfully flavourful – a little sweet and a little salty. Definitely flavours that I have not had elsewhere. Adding a bit of chili oil made the flavours even more intense. A pretty amazing dish overall. 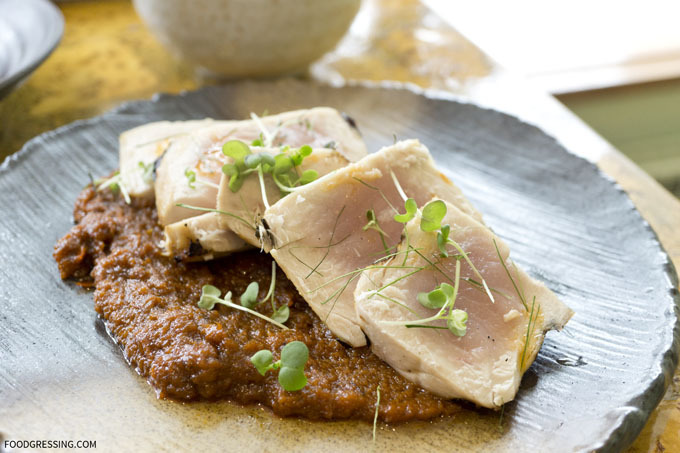 Much to our surprise, the dry red curry of grilled albacore tuna made our meal very *unfortunately* very memorable! The dry red curry was very sweet and would have gone well with the tuna except that that the tuna was overcooked. In fact, the edges of the tuna pieces were very tough and dry. In 2 out of 4 pieces, there was no dark pink and tender middle; the middle was whitish as it had been cooked through and through. I politely brought this to the attention of the server though late in the meal as we had eaten 3 out of 4 tuna steaks. The manager then came over to review our dish with the last piece uneaten and after inspection returned it to the kitchen without hesitation. I commend the staff for handling the situation with swiftness and grace as well as removing the item off the bill. While I am impressed with how the staff handled our overcooked tuna, I must admit that the service could overall be improved. There were two staff (one server and one manager) working and it seemed like they struggled to keep up with the busy restaurant. We did not have our water glasses topped up during the meal. Furthermore, the one server came to check on us 3/4 of the way through the meal which is a bit late. It also took a while for us to place the order and receive the bill. 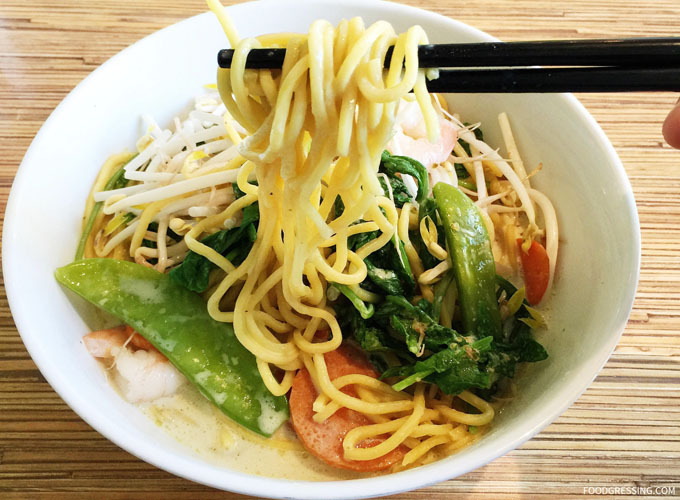 Fresh Bowl has been around for several years now and serves South East Asian-inspired eats that is affordable, fast and convenient. 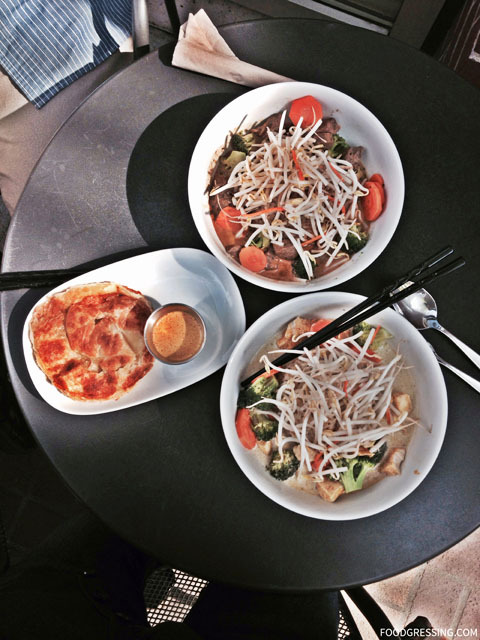 With two locations in Vancouver (Gastown and Yaletown), Fresh Bowl is a hit with the lunch-hour crowd in Downtown. 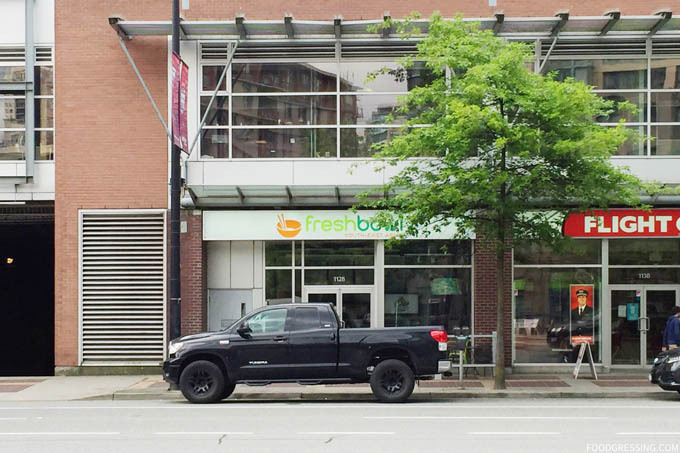 I have visited Fresh Bowl in Yaletown twice and here is a review of my experiences. 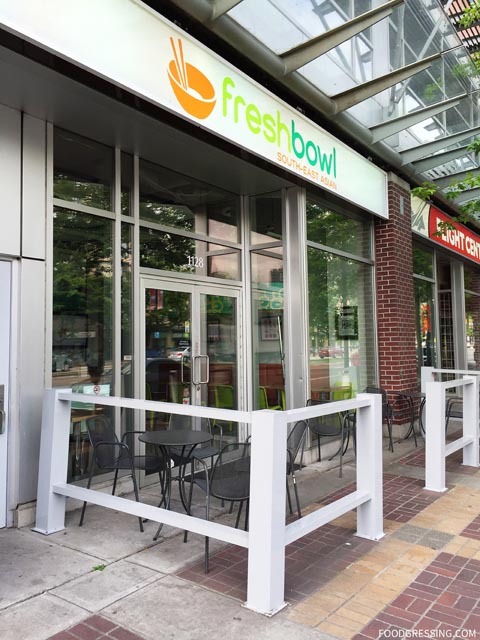 Fresh Bowl’s old menu featured a standard selection of South East Asian-inspired bowls like Malaysian Chicken Curry, Beef Rendang, and Singapore Laksa. More recently, they changed the menu into a more customer-driven build-your-own-bowl options. Starting at $10, you first choose your type of bowl (rice, noodle, or salad), sauce (green, yellow, coconut and more), and protein (chicken, beef, prawns, tofu, mixed veggies). Side options inclue roti, satays and coconut sago dessert. 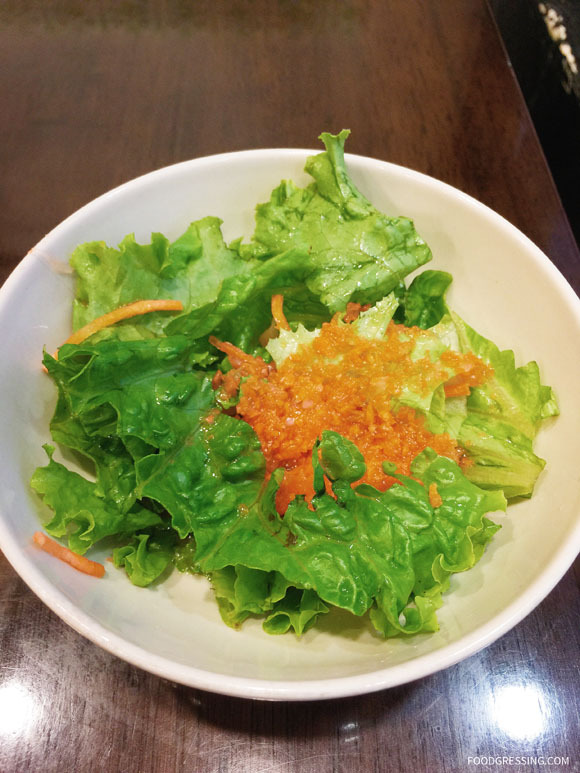 Fresh Bowl also has a commitment towards fresh and healthier ingredients. Their recipes are without MSG, artificial flavour enhancers and refined sugars. The chicken they use is Fraser-Valley grown, hormone free, and raised without antibiotics. Furthermore, their beef is Australian Organic grass-fed, halal certified, leaner than traditional meats and apparently higher in micronutrients and Vitamins E and B. They also use organic rice and organic mixed greens. 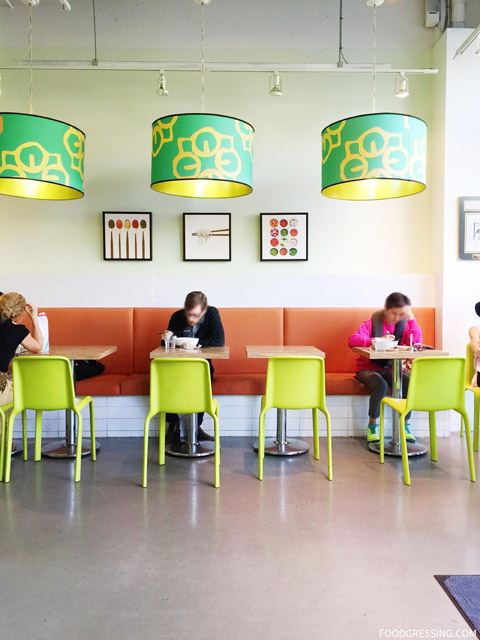 The interior of Fresh Bowl is very modern, bright and clean. 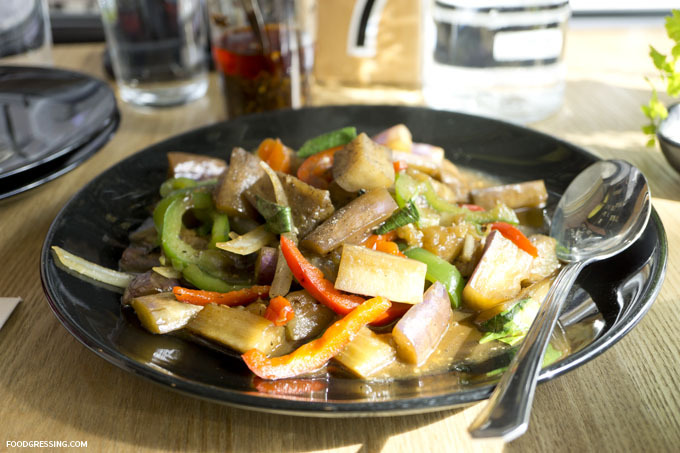 The food is prepared quickly so takeout is a very practical option if you are short on time. There are several tables for two but seating is limited. I would say that the space is not accommodating for large groups. My husband and I visited Fresh Bowl in 2014 when they had their own menu. I remember the food being just okay overall, nothing too memorable. The flavours were generally on point for something that is fast food. I recall that the roti canai was a tad greasy. However, I felt that the portions were small with more bean sprouts than everything else. More recently, I built-my-own bowl option with thick noodles, laksa (lemon grass coconut broth) and chicken. Similar to before, it was okay and portions again seemed on the smaller side. The mound of bean sprouts hide the fact that there wasn’t as much of the other ingredients. My thick noodles were al-dente and ingredients tasted generally fresh. 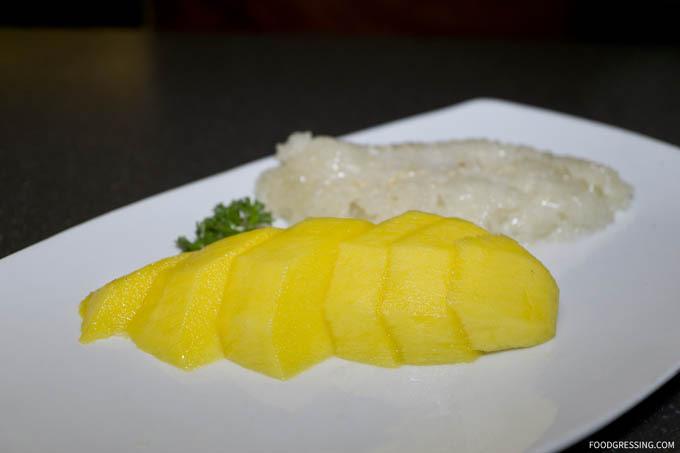 I came to know of Bai Bua Thai Cuisine after fellow foodie Darren (@misohungry_vancouver) posted a stunning photo of their Mango sticky rice dessert. I admit that I love mango-anything really and was instantly eager to try Bai Bua Thai Cuisine. At the same time, I learned that they were a family-run restaurant that had just opened five months prior; I was keen on trying a new eatery. My husband and I set out to Bai Bua for a late lunch earlier this week. 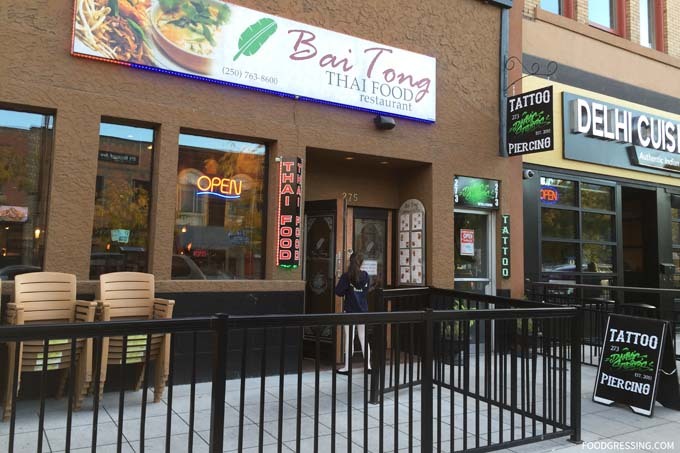 The menu at Bai Bua Thai is typical of a casual Thai restaurant in Vancouver and includes Thai curries, fried rice, and noodles. They are budget-friendly with most items under $10. Lunch combos with an entree, appetizer and soup are also available. It appeared that getting a full entree with a small bowl of rice seemed like a better deal than their lunch combo. The menu is fully available online. The interior is minimalistic but bright and cozy. Simple flower shapes adorning the white walls added to the relaxed ambiance. We ordered the khao soi gai or curry noodle ($10.99) which had Northern Thai style curry sauce and sliced chicken breast. The most interesting part was that it had two types of noodle: crispy and regular egg noodle. 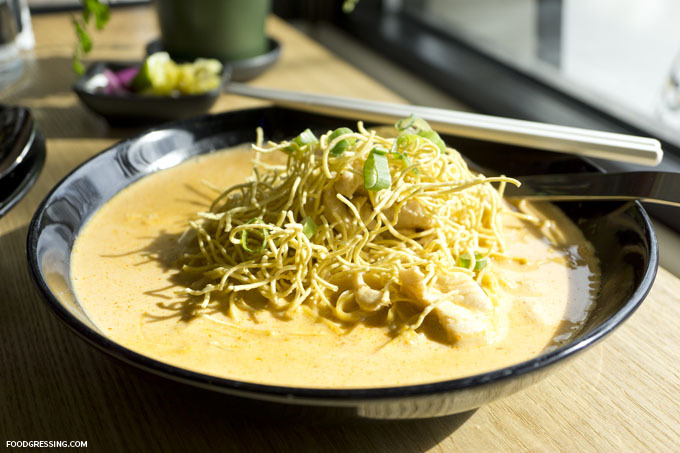 The crispy noodles were presented like a topping in a what seemed like a very large bowl of curry; the regular egg noodles were immersed within the curry. The curry itself was rich and flavourful. I would order this again. 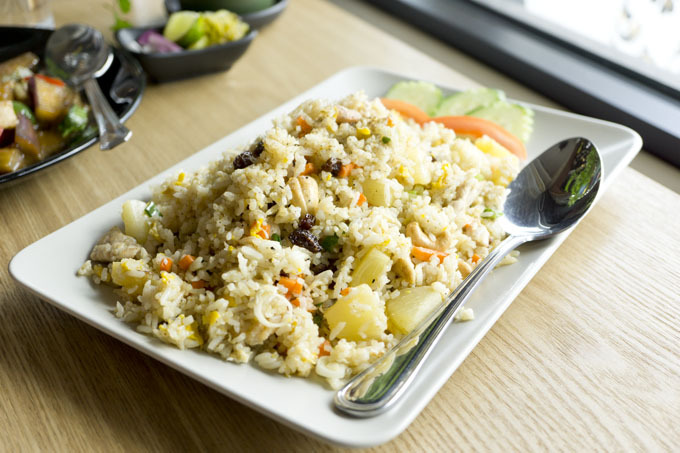 Another item we had was the March monthly special pineapple fried rice ($12.90). 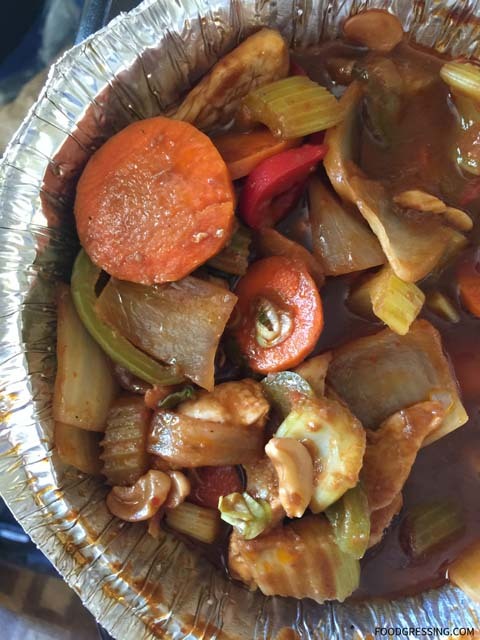 It had quite a few other ingredients including pineapple, cashew, raisin, curry powder, carrots, onion, and chicken. The rice came in a long rectangular dish and the portions seemed reasonable. The dish was beautiful with little punches of color from the carrots, pineapple pieces and raisins. However, I was very disappointed from the taste because the rice was simply very soggy. It was unfortunate. As an eggplant lover, I was keen to order the pad ma kueh ($10.99). 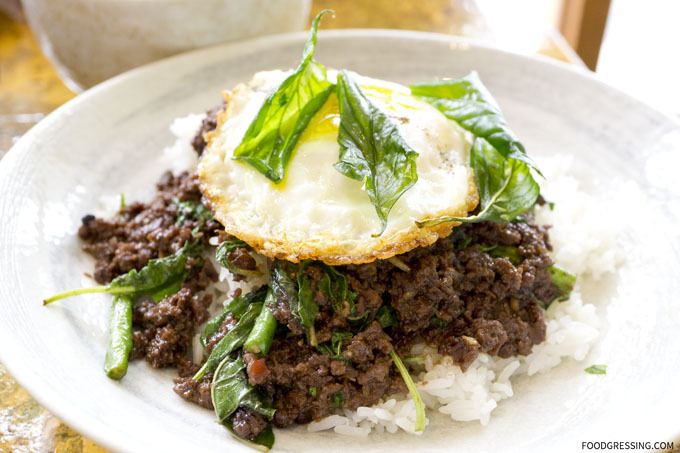 The dish was flavorful from the pepper and Thai basil with soy bean sauce. There was a bit of a miss from some of the eggplants tasting undercooked. Last but not least was the mango and sticky rice dessert ($9.90). 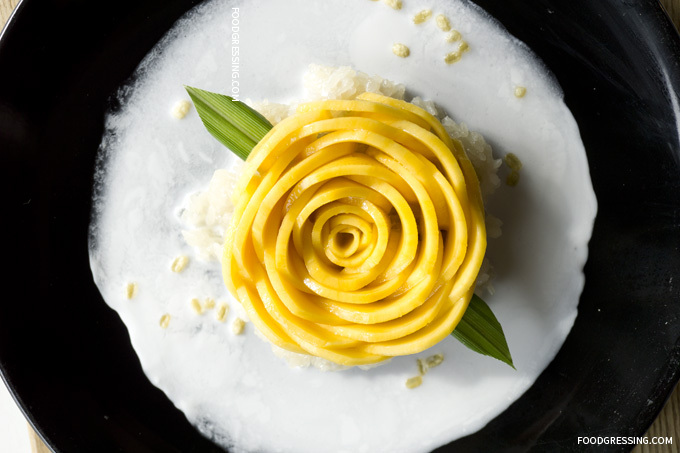 First of all, it was exquisite in presentation as the mango slices were arranged to look like a flower. The sticky rice was warm and provided a fun contrast to the cool mango slices and coconut milk. Beautiful and delicious, I would recommend it. It had been quite a few years since I ordered food from Mango Thai in Davie Village. 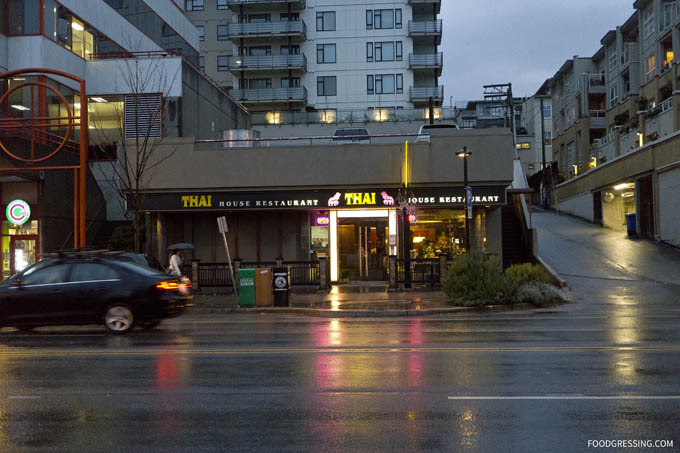 While Thai Basil on Davie is my go-to Thai restaurant in the neighbourhood, I decided to revist Mango Thai and see how their food compared. 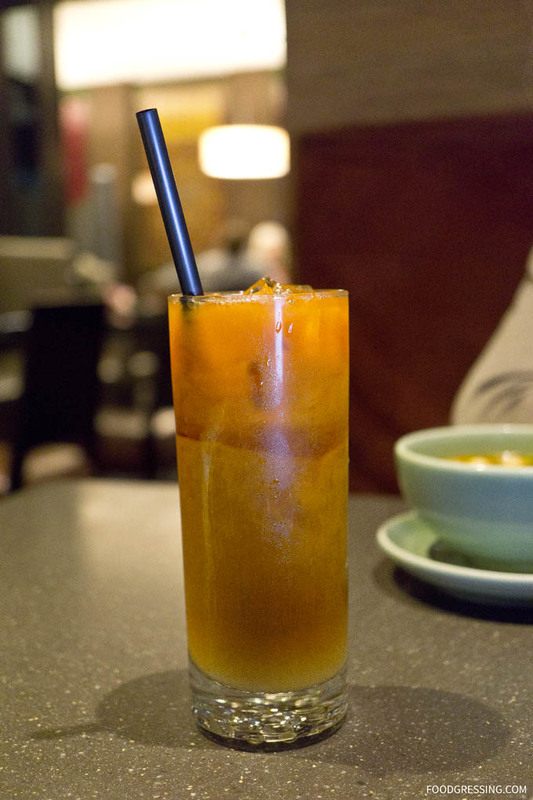 In this post, I will share with you my experiences with Mango Thai. 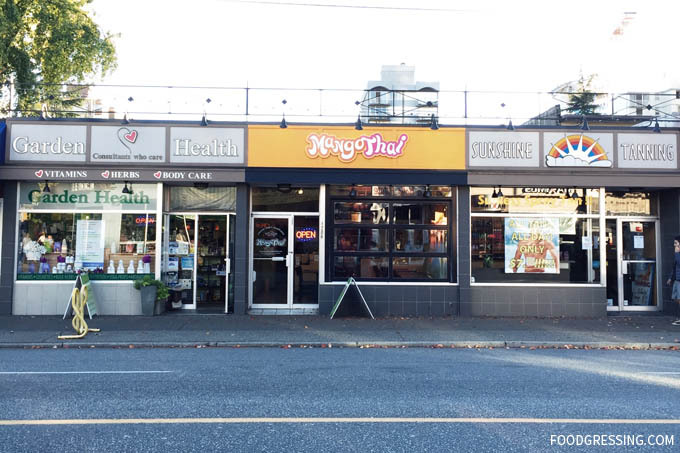 Located at 1206 Davie Street in the heart of Davie Village, Mango Thai is a small casual eatery serving fast Thai food. 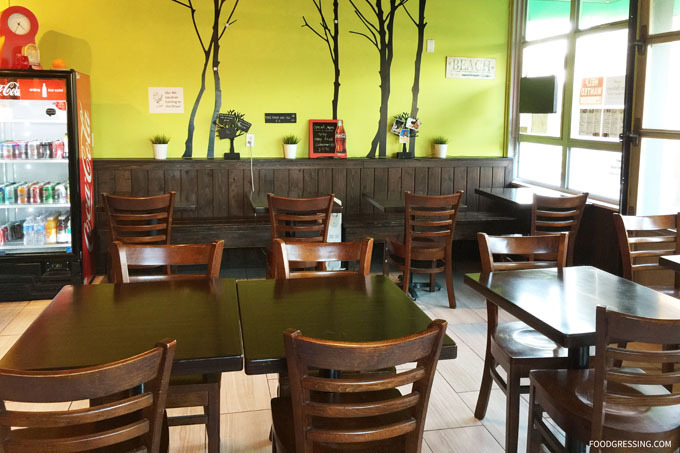 There are a few dining tables if you want to eat in, but many customers get take-out or delivery via JustEats.ca. Many of Mango Thai’s menu items under $10 so it’s easy on the wallet. 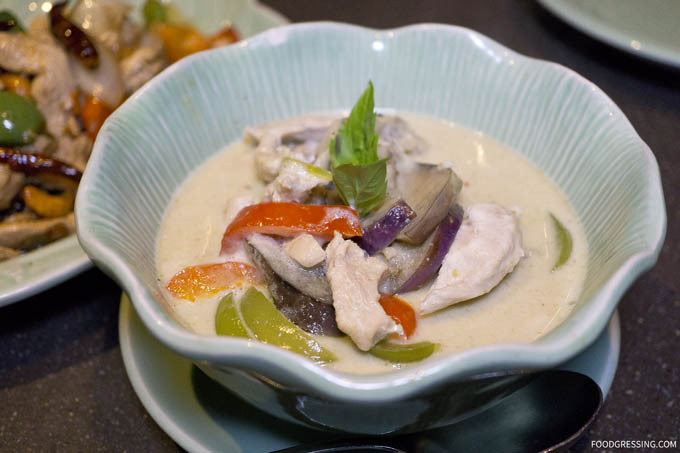 The menu features your usual Thai curries, rice and noodle dishes, soups (ie, Tom Yum-Yum), and salads. They have lunch specials for $7.99 until 3 pm which includes an entree with a spring roll, green salad and rice. 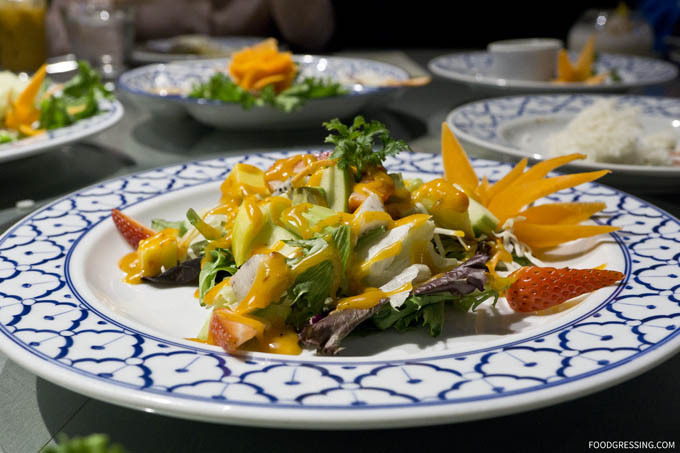 On the week-end, Mango Thai has special dishes like the Som Yum Papaya and Som Yum Apple salads. Spice levels range from mild, spicy, “starting to sweat” to “rocket fuel.” Their menu is available online. 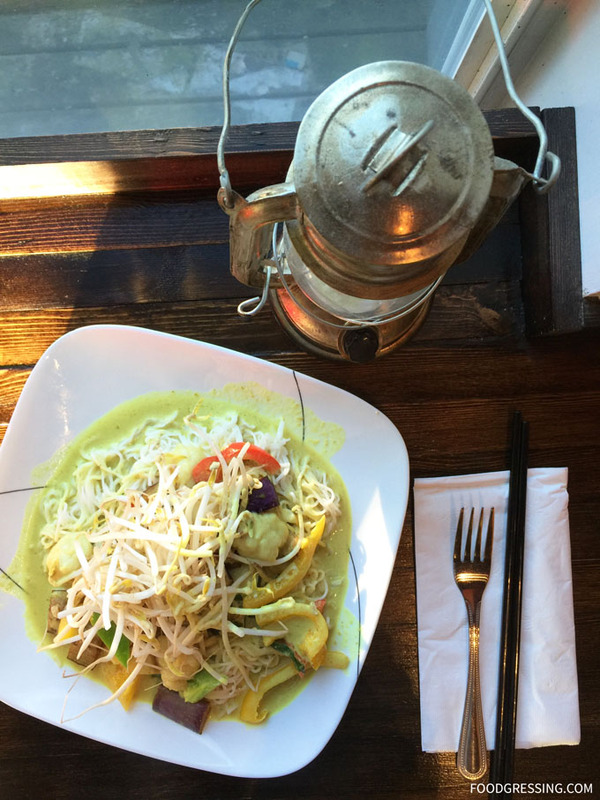 My first experience with Mango Thai was a green curry with chicken takeout. Pretty standard fast Thai food, and their version of the green curry was average. The portion of chickens were okay, eggplants were nice and tender and the curry had an acceptable creamy, savoury-sweet flavour. 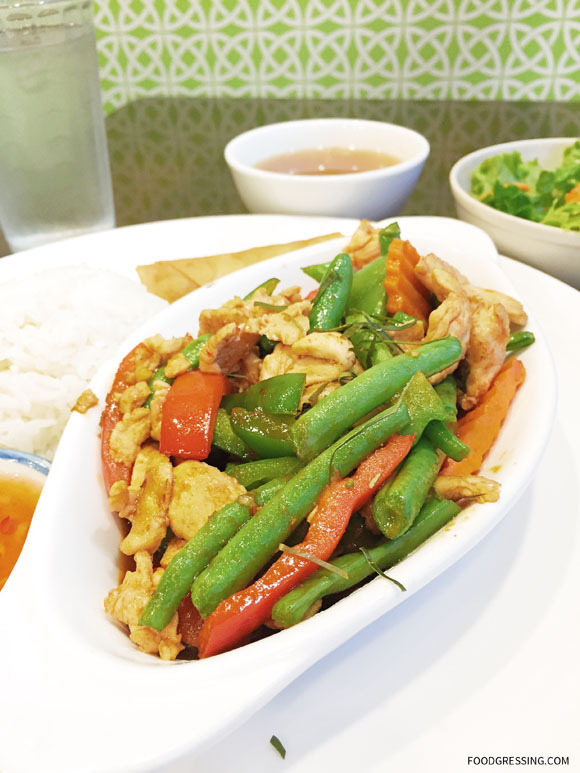 On my recent visit, I dined in and had a spicy green beans (Phad Prig Khing) entree combo ($11). It was recommended to me by their staff member so I was expecting it to be very good. I chose chicken as my protein and the other ingredients were Thai chili and garlic paste, crunchy green beans, bell peppers, and a kaffir lime leaf. It came with a soup, green salad, spring roll, and Thai sauce. The dish was overall underwhelming starting from the rice. The rice was nicely shaped like an inverted bowl, but was barely warm. The exposed rice was hard while the inner rice was soggy. The green beans were adequately crunchy but the overall dish was highly reliant on the Thai chili and garlic paste for flavour. The spring roll was minimally crispy and very greasy. Finally, I did not have the savoury soup as I found it to be too salty. 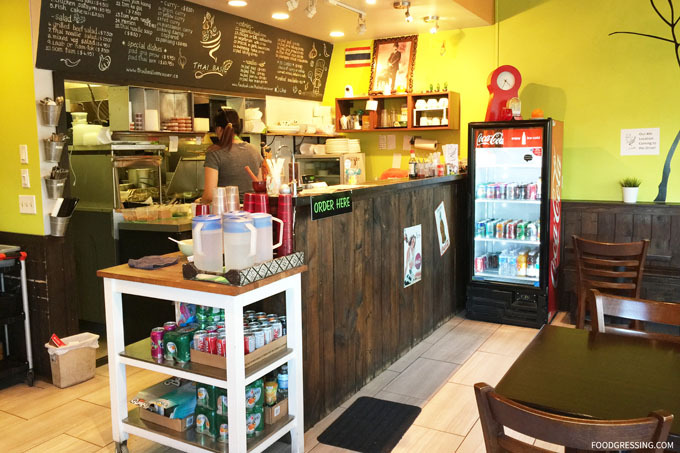 For more information on Mango Thai, visit them at their website.